The $20 million revitalisation of the Sunshine Coast’s first shopping centre has been delivered by Reed Property Group with the official opening to be held this Easter Saturday, 4 April . 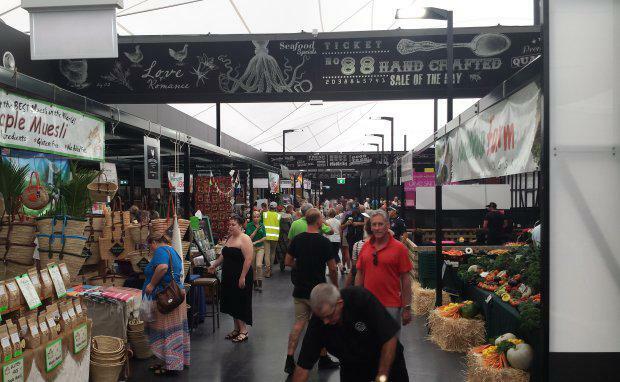 Big Top Market Fresh at Maroochydore will be the first centre in Australia to incorporate traditional market days with local farmers alongside a full-line Woolworths Supermarket, chemist, newsagent, bottle shop and other convenience and specialty retailers. The three hectare site in Maroochydore’s Principal Activity Centre is owned by Reed which launched the Ocean Street dining and entertainment precinct as Stage One of the project last Easter. Head of Development Jay Emmerton said the group was excited to officially open the project. “Nowhere else can you access the convenience of specialty stores with the excitement, colour and fresh flavours of local farmers’ markets in the one place,” Mr Emmerton said. The Farmers Markets will be managed by Shane Stanley who has been running the Noosa Farmers’ Markets since 2002. The markets were named by travel review giant TripAdvisor as number 1 in the Top 10 markets in Australia for 2013 as decided by thousands of travellers from around the world. Mr Emmerton said that together with award-winning farmers’ market operator and Restaurant Australia ambassador Shane Stanley Big Top Market Fresh would proudly play a key role in positioning Maroochydore as a destination where residents, workers and tourists can access convenient and fresh services with a true local flavour. Sunshine Coast Mayor Mark Jamieson described The Big Top is an iconic Sunshine Coast building and said he was very pleased to be able to see the really positive results of its ambitious redevelopment. “The Ocean Street Dining and Entertainment Precinct has undoubtedly been an outstanding success and with the revitalisation of the Big Top, we now have a key destination for fresh food, dining and entertainment on the Sunshine Coast that is providing a fine service for our community by supporting our local produce growers and creating local jobs. “It is certainly an exciting time in the history of the heart of Maroochydore,” Mayor Jamieson said. Mr Stanley acknowledged the vision of Reed Property Group in providing a venue that would allow farmers to integrate into a retail environment without losing their authenticity. “This has been a big effort from Reed to research, develop and deliver this concept and I believe that this will redefine how customers interact with local producers and integrate them into their daily lives,” he said. Mr Stanley said he had been overwhelmed with responses from growers and would have more than 100 local producers for the opening weeks with the market days initially running on Wednesdays from 10am-6pm; Fridays from 3pm-9pm and Saturdays from 8am until 3pm.